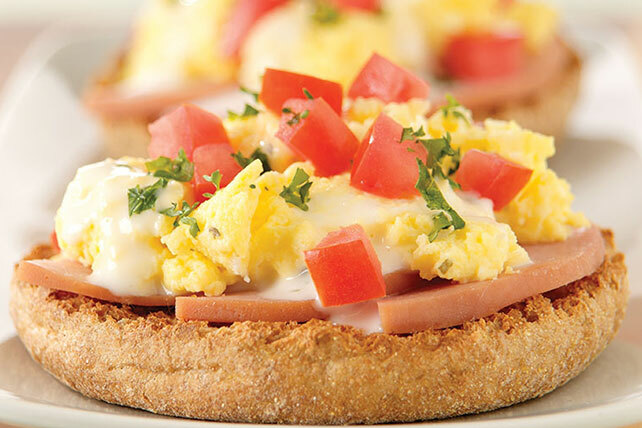 Make every day a good day for eggs Benedict with this tasty Canadian Bacon & Ranch Eggs Benedict recipe. Check out this Canadian Bacon & Ranch Eggs Benedict today to find out what surprise ingredients replace the Hollandaise sauce! Heat Canadian bacon as directed on package. Meanwhile, combine remaining 1/4 cup dressing and the milk in small microwaveable bowl. Microwave on HIGH 20 sec. or until heated through. Cut Canadian bacon slices in half. Place muffin halves, cut-sides up, on serving platter. Top each with 3 Canadian bacon slices. Cover evenly with the egg mixture, dressing mixture, tomatoes and parsley. Cut 4 KRAFT Slim Cut Sharp Cheddar Cheese Slices in half. Place 1 cheese piece on each toasted muffin half before topping with remaining ingredients as directed. Prepare as directed, omitting the heating step of the Canadian bacon.